We at Offshore Sailing School are passionate about supporting The Leukemia & Lymphoma Society (LLS) because the research and cures that have been developed through this organization’s efforts are so important. Although the focus is on blood cancers, the LLS reach carries over into the whole medical research and cures realm, including many other forms of cancer. Join us in the campaign to cure blood diseases and cancers. Please visit www.lls.org/offshoresailingschool to learn more. Since 2009 Offshore Sailing School has been a national sponsor of The Leukemia Cup Regatta program – a nationwide effort to raise money for research to cure blood cancers and diseases. Every year more than 40 yacht clubs, sailing associations and groups across the country hold Leukemia Cup Regattas and each year LLS organizes a Fantasy Sail Weekend with regatta spokesperson Gary Jobson (in photo above with red hat and standing between Doris and Steve Colgate with check), to thank donors. Efforts from these Regattas topped the $50 million mark in 2014. In 2004, 2008, 2011 and 2013, Offshore Sailing School hosted Fantasy Sail Weekends, donating use of our entire fleet and staff. 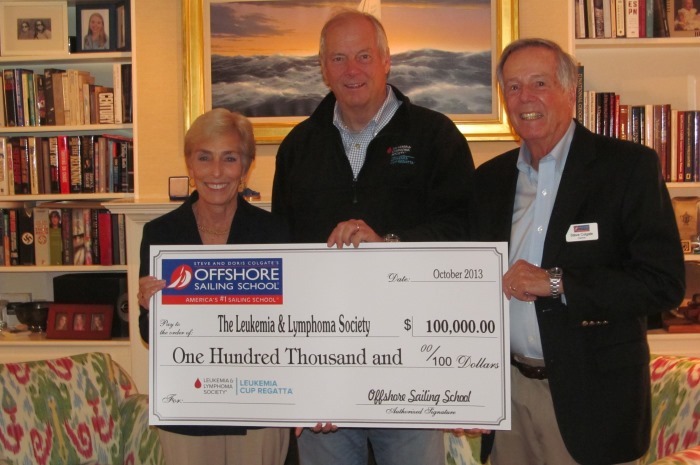 As a national Leukemia Cup Regatta sponsor Offshore Sailing School has donated more than $140,000 in cash from course tuitions, and close to $175,000 in course contributions for Leukemia Cup Regatta event auctions. “In recognition of outstanding efforts and support of The Leukemia & Lymphoma Society,” the LLS Board of Directors presented its Chairman’s Citation to the Colgates in 2013. Did you know that heart disease is the #1 killer for women? Since 2012 Offshore Sailing School has been a corporate sponsor for the Southwest Florida Chapter of the American Heart Association’s annual Heart Walk and Go Red for Women campaign. Doris Colgate is a legacy Go Red for Women member, Steve Colgate is a legacy member of the Red Tie Society – helping to raise money for the Go Red For Women initiative to save women’s lives. Offshore Sailing School receives requests daily to support all kinds of fund raising efforts across the country in hard cash or in-kind course donations. If you feel you have a worthy cause, send your request and proof of not-for-profit status to Beth Oliver, Director of Marketing for Offshore Sailing School – boliver@OffshoreSailing.com. Because of the volume of requests and our designated budget for philanthropy please be aware your cause may not fit our mission or we may have fulfilled our quota for the year.